The US plans are based on the belief that the North Koreans would not be successful in consolidating their gains around Seoul and would be pushed back across the DMZ -- though the plans assume the North may break through the DMZ in places. A critical issue is strategic warning of unambiguous signs that North Korea is preparing an attack. The warning time has reportedly been shortened from about ten days to about three days as North Korea has covered its military activities. The United States and ROK have developed as series of plans to counter a potential DPRK attack. The first plan would be a preemptive strike against DPRK positions to counter an emanate North Korean offensive. Likely targets in a preemptive attack are likely to be artillery positions and bombers before they could be activated. Under this plan, the ROK and the United States, both must agree that a DPRK attack is eminent and that a preemptive strike is necessary. The second plan would go into effect following a North Korea attack. Since the late 90's the United States has developed OPLAN 5027, which includes defense of the southern peninsula as well as direct assaults against North Korean targets beyond the DMZ and "defeating them in detail". This "defeat in detail" is said to include provisions to seize Pyongyang and instituted regime change. In these provisions, the United States would attempt to bring roughly half of its combat force to reinforce forces already in place. According to the 04 December 2000 South Korean Defense Ministry White Paper, the United States would deploy up to 690,000 troops 160 Navy ships and 1,600 aircraft deployed from the U.S. within 90 days on the Korean peninsula if a new war breaks out. The U.S.-ROK defense plan would be shaped not only by the threat but also by the mountainous terrain. Korea is commonly regarded as rugged infantry terrain that invites neither mobile ground warfare nor heavy air bombardment, but North Korea has assembled large armored forces that are critical to exploiting breakthroughs, and these forces would pass down narrow corridors that are potential killing zones for U.S. airpower. U.S.-ROK forces would conduct a vigorous forward defense aimed at protecting Seoul. Their campaign would be dominated by combined-arms ground battles waged with infantry, artillery, and armor. 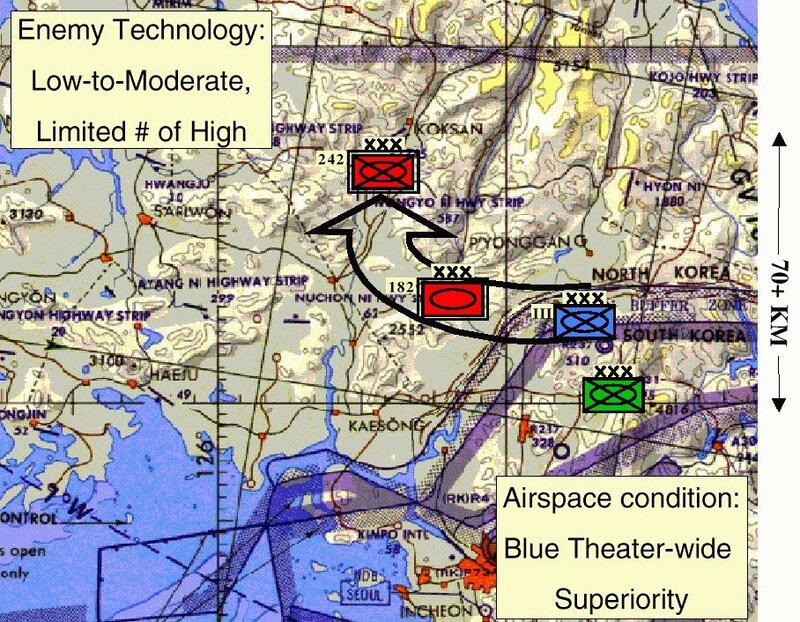 U.S. air and naval forces would conduct close air support, interdiction, and deep strike missions. After Phase 1, U.S.-ROK operations in Phase 2 would probably focus on seizing key terrain, inflicting additional casualties on enemy forces, and rebuffing further attacks. Phase 3, to start when the U.S. ground buildup was complete and ROK forces were replenished would be a powerful counteroffensive aimed at restoring the ROK's borders and destroying the DPRK's military power. A major air campaign against northern forces would be required before the counteroffensive could begin. A US Marine Expeditionary Force (in division strength) and the 82nd Air Assault Division, along with ROK divisions, would launch an overland offensive north toward Wonsan from the east coast. Soon thereafter, a combined US-ROK force would likely stage an amphibious landing near Wonsan, and advance to Pyongyang. Subsequently, a combined US-ROK force would execute a major counteroffensive from north of Seoul aimed at seizing Pyongyang. This would be achieved either by linking up with the force at Wonsan, or meeting it at Pyongyang. North Korea, devastated during the Korean War, also places great emphasis on maintaining a strong defense. 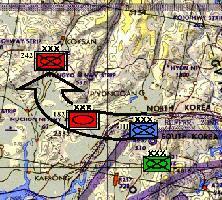 To achieve the strategic defense mission, North Korea has established defensive belts. They are designed to defeat any attack from ground or amphibious forces. The main strategic belt runs from the DMZ to Pyongyang. This belt contains over two-thirds of the DPRK's active maneuver ground forces. Ground defense along this belt is carried out by MPAF and corps level units. Two army-level headquarters may be activated for wartime operations. The navy provides coastal defense, and the army provides ground anti-landing defense. The air force and anti air artillery units of the army provide defense of DPRK airspace. At the initiation of a DPRK ground offensive, the North's reserve forces, numbering some 5 million, would man a pre-established, in-depth national defense network.